Reigate Castle is a late 11th century earthwork ring-motte and bailey fortress, founded by William de Warenne. In the 12th century, the earls of Surrey founded the stone castle, which was strengthen in the late 14th century. The site was ruinous by 1441 and after being occupied in the Civil War, the fortifications were slighted in 1648. 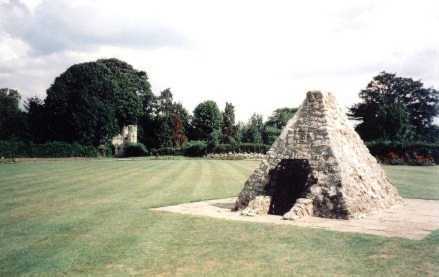 The large oval motte encased by a deep wide ditch, now supports a small stone pyramid, which guards an underground sallyport, that emerges level with the bottom of the ditch. A mock medieval gateway of 1777, guards a very large outer bailey, which is still partly encased by a wide wet ditch. 4 miles east is Bletchingley Castle and 5 miles west is Betchworth Castle. Reigate Castle is located in the town centre, off High Street in a public park. 22 miles south of London, on the A23-A242. The site is freely accessible in daylight hours and the caves are accessible by a guided tour.